Queensland, abbreviated as Qld, is the second largest and third most populous state in Australia. Situated in the northeast of the country, it is bordered by the Northern Territory, South Australia and New South Wales to the west, southwest and south respectively. To the east, Queensland is bordered by the Coral Sea and Pacific Ocean. Queensland has a population of 4,580,700, concentrated along the coast and particularly in the state's South East. The state is the world's sixth largest subnational entity, with an area of 1,852,642 km2. The capital and largest city in the state is Brisbane, Australia's third largest city. Referred to as the 'Sunshine State', Queensland is home to 10 of Australia's 30 largest cities and is the nation's third largest economy. protect and manage Queensland parks, forests and the Great Barrier Reef tor current and future generations. ensure the integrity of the racing industry across Queensland. The Queensland Parks and Wildlife Service (QPWS), established in December 1998, is a subsection of the Department, and its primary concern is with the development and maintenance of protected areas within Queensland so as to permit permanent preservation of the area's natural condition. ​Herbie, a symbol of QPWS since 1976, is widely recognised in the Queensland community and internationally and is now intrinsically linked to Queensland’s world-class experiences. Herbie is a Herbert River ringtail possum Pseudochirus herbertensis which is unique to Queensland. These possums live in the tropical upland forests between the Herbert River Gorge and Cooktown in far north Queensland. Their habitat is restricted and they are rarely seen as they move around the highest branches of the forest at night. The Herbert River ringtail possum depends on careful management of the environment for its survival, and is a symbol of our responsibility to protect our natural heritage. Queensland is home to over 1,000 National Parks, forests and other protected areas, including five World Heritage Areas - more than any other State. The QPWS manages over 12.5 million hectares of land which is an area larger than 50% of the world's countries. the Great Barrier Reef Marine Park (in partnership with the Commonwealth). "National parks are special places which protect and conserve outstanding examples of Queensland's natural environment and cultural heritage." "A nature refuge is an area of land voluntarily protected for conservation, while allowing compatible and sustainable land uses to continue​. A nature refuge is negotiated through a legally binding, perpetual nature refuge agreement between the landholder and the State." "Marine parks established over tidal lands and waters protect and conserve the values of the natural marine environment while allowing for its sustainable use. They protect habitats including mangrove wetlands, seagrass beds, mudflats, sandbanks, beaches, rocky outcrops and fringing reefs." ​The Nature Conservation (Protected Areas) Regulation 1994 lists all Queensland parks and nature refuges as at 24th June 2016. There are a total of 306 National Parks in Queensland, which includes 22 Cape York Peninsula Aboriginal Land (CYPAL) National Parks. The 2016 Subordinate Legislation No. 104 - “Nature Conservation and Other Legislation Amendment Regulation (No. 2) 2016” list the changes made on 1st July 2016 when Regional Parks were abolished and returned to the tenures of Conservation Park or Resources Reserve. The nine (9) National Parks (Scientific) were also reinstated at this time and are listed in the Subordinate Legislation. The National Park (Recovery) category was deleted on 24th March 2014 and has not been reinstated. Different types of National Parks in Queensland. Cape York Peninusula Aboriginal Land (CYPAL) (IUCN Category II). A new class of protected area has been created on Cape York Peninsula in Queensland as above, which allows for some existing and proposed national parks to become aboriginal land and also be dedicated and managed as a National Park (CYPAL). Traditional Owners (TO’s) will be the owners of the land through a grant of Aboriginal freehold title, provided the area will always be managed as a national park. Queensland has undergone substantial change in recent years with regards to park categories. The Nature Conservation (Protected Areas) Regulation 1994 (most recent version is 24th June 2016 and can be downloaded below) lists all of the current Queensland parks and refuge areas. The 2016 Subordinate Legislation No. 104 Nature Conservation and Other Legislation Amendment Regulation (No. 2) 2016 (can be downloaded below) lists the changes made on the 1st July 2016, when Queensland Regiona Parks were abolished and returned to the tenures of Conservation Park or Resources Reserve. The nine National Parks (Scientific) were also reinstated at this time. ​The Nature Conservation (Protected Areas) Regulation 1994 has been amended a total of 19 times between 2013-2016. The National Park (Recovery) category was deleted on 24th March 2014 and has not been reinstated. This former category applied to those locations that had been declared protected areas but whose cultural and natural resources and values were considered not to be up to full national park standard at the current time of declaration. They were usually areas that had been subject to a previous use such as forestry or some form of agriculture. They were managed to restore to the greatest possible extent to the parks natural condition and protect and restore the conservation values so that they could be dedicated as a national park. Any use of the park was to be nature based or consistent with an approved regeneration plan. They could be contiguous with an existing national park or a separate area. It should be noted that the Queensland National Parks website does not list all of Queensland's Parks that are in the Estate Register. Some parks are accessible to the public, and some are considered scientific or heritage and are not accessible to the general public. There are currently 531 qualifying parks in Queensland for the WWFF program. ​Queensland has a total of 307 National Parks, and 223 Conservation Parks, all of which qualify for the WWFF program. Also qualifying is the Great Barrier Reef Marine Park. Blue Lake National Park VKFF-0040 - is now part of the Naree Budjong Djara National Park. Cedar Bay National Park, VKFF-0093 - now called Ngalba Bulal National Park. Name changed on 4th November 2011. Dipperu NP, VKFF-141 - this is a Scientific NP, and no public access is allowed. Epping Forest NP, VKFF-156 - this is a Scientific NP, and no public access is allowed. EWFField, VKFF-165 - enquiries underway to establish where this is ? Fraser Island National Park VKFF-0186 is now known as Great Sandy National Park VKFF-0216. Forbes Island NP, VKFF-177 - now called the Wuthara Island National Park. The name was changed in 2011. Girringun NP, VKFF-199 - was formerly called Lumholtz NP. Name changed in 2003. Great Sandy NP, VKFF-0216 - consists of Northern Cooloola Section; Coolooola Secion; Fraser Island; Southern Cooloola Section; & Woody Island. Kutuni-Payamu National Park, VKFF-244- (CYPAL). Formerly called Iron Range National Park. Name changed on 5th August, 2011. Keppel Bay Islands (scientific), VKFF-262 - this is a Scientific NP, and no public access is allowed. Rinyirru National Park, VKFF-279 - Formerly called Lakefield National Park. Name changed on 1st July, 2011. Boodjamulla National Park, VKFF-282 - Formerly known as Lawn Hill NP. Name changed on 14th February, 2003. Lumholtz NP, VKFF-297 - now called Girringun NP, see VKFF-199. Murray Upper National Park - now known as Girramay National Park. Palmgrove VKFF-408 - this is a Scientific NP, and no public access is allowed. Ma'alpiku Island VKFF-430 - Formerly known as Restoration Island. Name changed on 5th August, 2011. Simpson Desert National Park - now known as Munga-Thirri National Park. Mount Webb NP VKFF-0365 - was gazetted as Daarrba NP VKFF-1194 on 29th November 2013. North East Island National Park VKFF-0393 was amalgamated with South Island NP on 24th March 2000 to become Percy Isles National Park VKFF-1214. Round Top Island NP VKFF-0434 was gazetted as Yuwi Paree Toolkoon NP on 19th November 2010. Tam O'Shanter National Park - now known as Djiru National Park. Taunton NP, VKFF-483 - this is a Scientific NP, and no public access is allowed. A total of 223 Conservation Parks were added to the WWFF Directory. These parks had not previously been included as they had all been created after 2008 (the year in which the Directory was initially formulated). 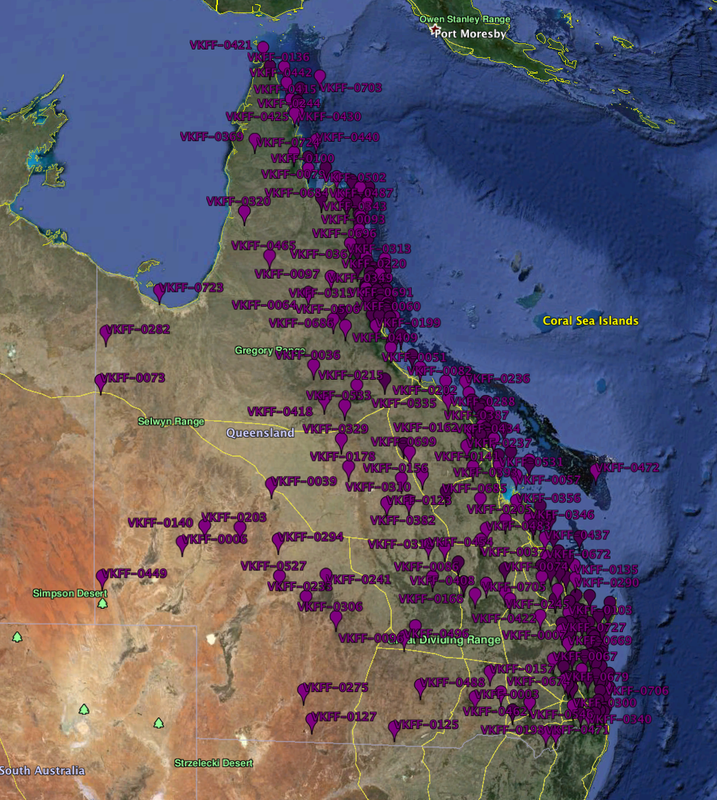 To view interactive online maps and data for Queensland, check out WetlandMaps. 3. 'A Master Plan for Queensland's parks and forests to 2025, 2014, Queensland Government.